A push stick isn't doing much good if you can't find it! Push-Loc comes with an exclusive docking station that mounts to your tool so Push-Loc is always upright and ready for use. The docking station is also a handy pencil tray, and it even holsters two tape measures. 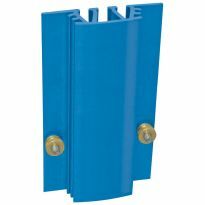 Push-Loc's innovative handle is offset to the left for better safety and visibility. It gets your hands out of harms way, allows you to see your workpiece better, and you won't bang your knuckles on the blade guard. 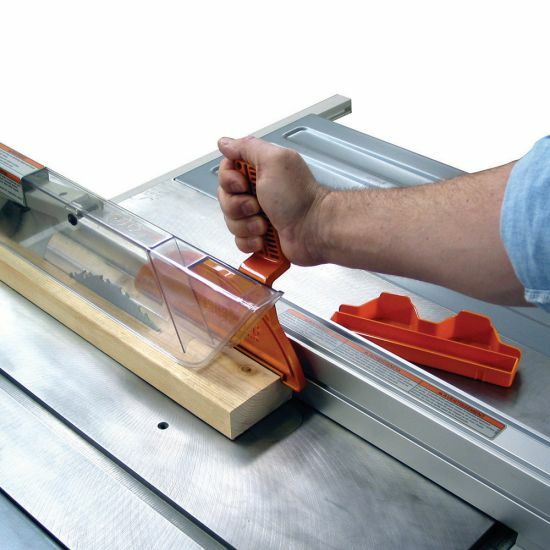 The offset also allows you to use it horizontally on the router table. I liked what I saw at the store, but once I got it home and tried it, I was even more impressed. The off set handle keeps your hand/fingers away from the blade. I like the holder it keeps the Push-Loc near my saw where it belongs. 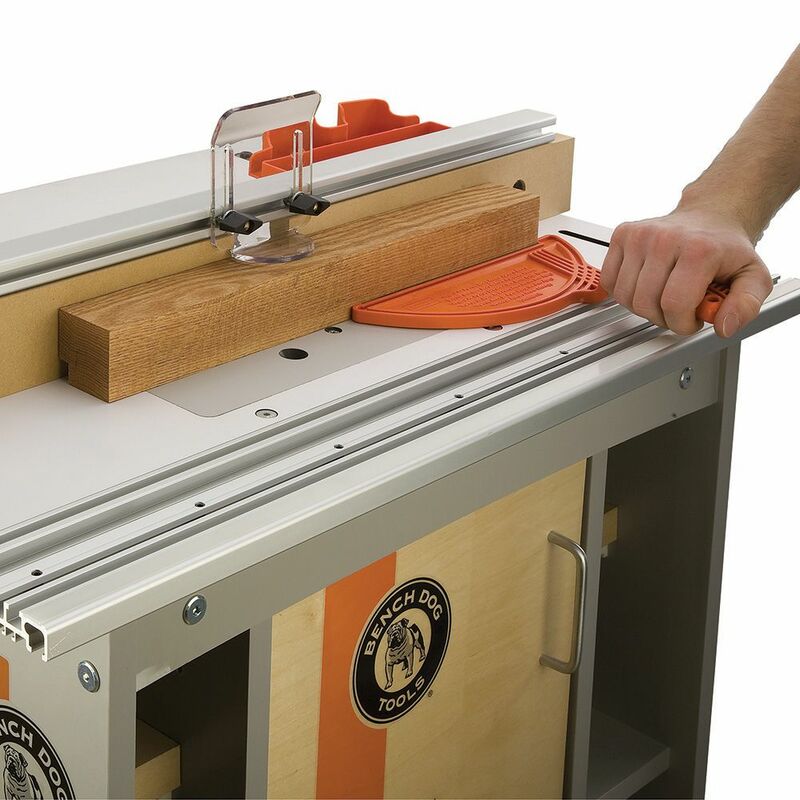 Holds wood pieces down securely while pushing through the saw. For thin rips requiring a positive hold the Bench Dog is the choice. I especially like the holder that keeps it handy. I must have a half dozen push sticks of all shapes and sizes. I bought this one because it is perfect for skinny pieces and with the handle offset it clears between my dust collection blade cover and the fence while pushing the part through. Not finding much use for the base so far though. I like that your hands are far away from the blades. Goal is to go into the shop with ten - come out of the shop with ten. The offset handle is nice as is the slim profile. Great for jointing too. Small, embedded super magnets would be nice to steady the holster on the table saw but easy enough to add. 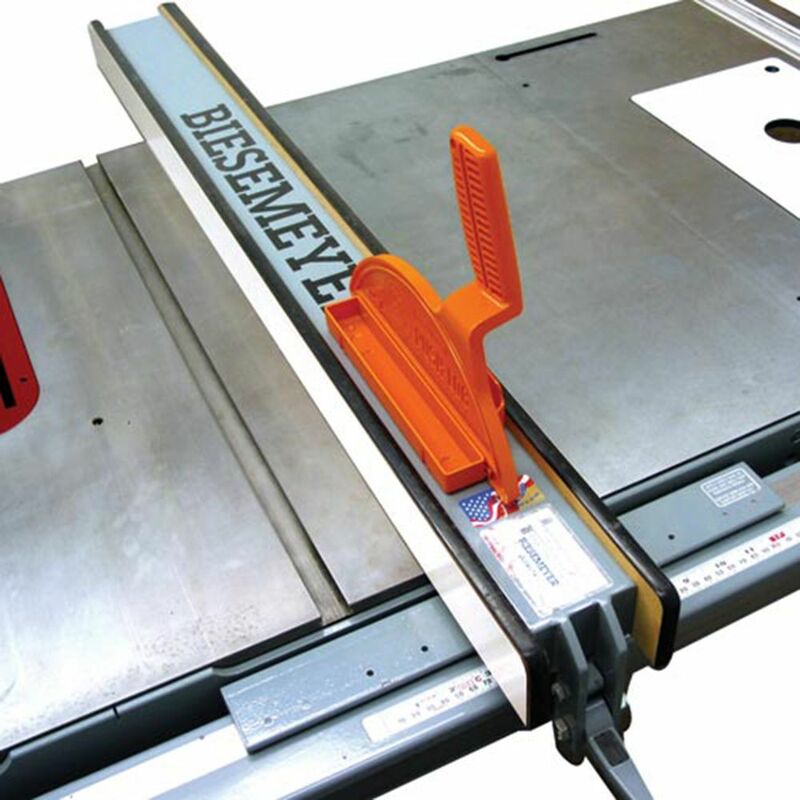 Innovative offset design keeps your hand away from the saw blade. The holder works OK, but the I use larger tape measures than the tray allows. All in all a good tool. 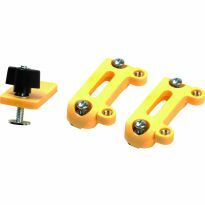 Great push tool much better and safer than any other push tool/stick that I have used. Great addition to my shop. Safety always counts. I use this a lot. Great for the table saw and thin ripping. I like the offset handle design on this thing. 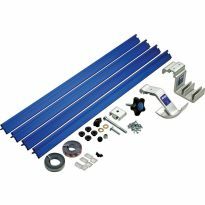 This product enables one to push wood easily and safely when there is tight space between the saw fence and running saw blade. 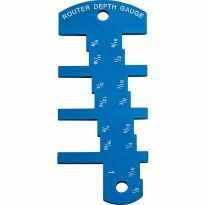 This was recommended to me by the salesman at my Rockler store, and it has turned out to be a useful little tool for controlling the cutting of narrow stock on the table saw. I particularly like the rubber-like material that grips the top of the work piece. I only hope the rubber, or the adhesive that attaches it to the body of the tool, doesn't age too quickly. This is actually very much needed for my shop. I use a overrarm blade guard and when I rip narrow ish parts, the fence is too close to the guard and makes it difficult to push stock through. With this it just goes right above the fence and out of the way of the guard. It’s great. The base is ok too but not needed. Sell for less and eliminate the base. Very easy and safe tool to use. Very handy if dealing with narrow parts between table saw blade and fence. Works well for all situations. I love that I can keep my fingers further from the blade. Great tool thanks so much. Very simple, effective. Got it on sale for $7.50 which seems about right. Not sure I’ll ever use the tray it comes with. found it to be extremely usefull I do a log of small cuts on my table saw and this push block allows me to leave my saw blade cover in place. I like this one for ripping in tight areas. It is thin but sturdy. This thing is inexpensive and works great. I bought this push stick to replace some old wood ones that I had made. They didn't work well when ripping stock as they always seemed to get hung up on the blade guard. 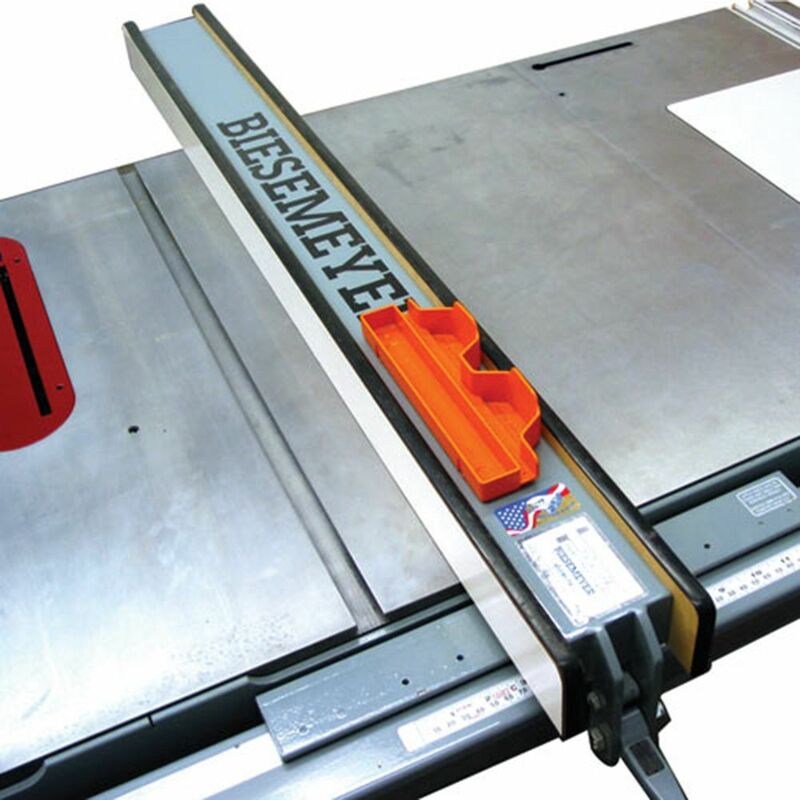 This product works really well on the table saw and band saw. I would recommend this product. I picked this up at Rockler a couple of weeks ago because it was interesting and inexpensive. The tray won't fit in my Delta fence, but I'll come up with a work-around. 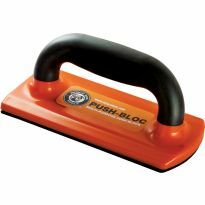 The push block itself is surprisingly strong and rigid, is grippy underneath and has a nice, solid catch at the back for pushing your workpiece. It would easily push through a quarter inch cut. Anything smaller than that you need a Gripper to do it safely. When you inevitably chew it up, it's is inexpensive enough to simply replace. I use it with small boards on my table saw. It works great. This is my go to safety item on the table saw. I have the Micro Jig as well but find it cumbersome to set each time and I'm not convinced it's safer. The Micro Jig does allow you to push horizontally against the fence but if your edges are square, that's not much of an issue. This is well worth the money. Buy it! The push stick is narrower than the ones I have owned in the past. I thought that this would be a disadvantage, that I needed to be able to apply more power. But it turns out to be an advantage; it is plenty strong enough and its narrower profile means you can make thinner cuts. Great item, easy to use. But the attachment part is less desirable for my use. Works perfectly. Anything that saves your fingers is a good product. had one for years and used it almost every time i turned on my table saw. lost it at a job site. panicked when i didn't see it in the catalog but found it shopping Rockler online. Whew!! got 2 just to be sure i had a spare. I feel much more confident using this inside of a stick. I especially like the offset handle because it keeps your hand farther from the blade. The caddy is a waste as far as I'm concerned. It's going to save some fingers. I use my own push blocks made from scraps, but this item is very useful as shown. The offset handle and thin profile works great even with my bladeguard in place. 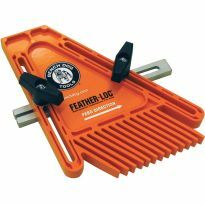 I have a friend that has one of these and when I saw him use it on his band saw, I had to have one. It grips good and keeps the fingers far away from the blade. Great product. The push block itself works good. The cradle maybe needs some magnets on the bottom or something to keep it upright. 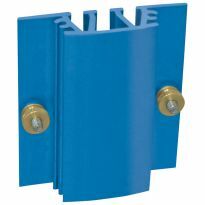 great accessory to the table saw, does a good job holding down your project while you are cutting. I got tired of making my own, so I thought I'd try this one. Very nice design, works great. I love using this tool. The only issue is with the glue eventually letting go from the non-slip pad. It would be good if replacements were available (or included). Great tool. It is handy for thinner stock. It appears to allow me to use the blade guard and still push through narrow stock. I'v already had 8 stitches once, that's enough. On sale, the offset handle looks pretty useful. I like the idea of moving my hand further away from the blade, particularly when making thin cuts and the fact that you can use it horizontally is an added bonus. Always need good push sticks. I have already lost three 3 finger tips. Don't need another accident. Great price and needed one. My old handmade push stick could be upgraded! We had an employee get hurt running a table saw, He was not using his guard or a push stick. I'd like to prevent the next person from getting hurt by providing them the tools they need to be successful. To keep hands further away from blade, plus extra storage is nice. I like that it's thin and I like the offset handle. Not sure if I'll use the docking station. The woodworking class I attend only has wooden bench dogs, and I would like to try these. Safety for my fingers and against kickbacks. On sale and just trying it. I never get around to making my own jigs & do a lot of small work. I like the angled over handle. saw an ad on you-tube and am quite curious about this item. A friend told me about this great product. Gift for husband who does this type of work. Liked the off set handle for use at the router table. WHAT IS THE DISTANCE BETWEEN THE OFFSET AND THE BOTTOM OF THE PUSH BLOCK? BEST ANSWER: I think I may have misunderstood your question. 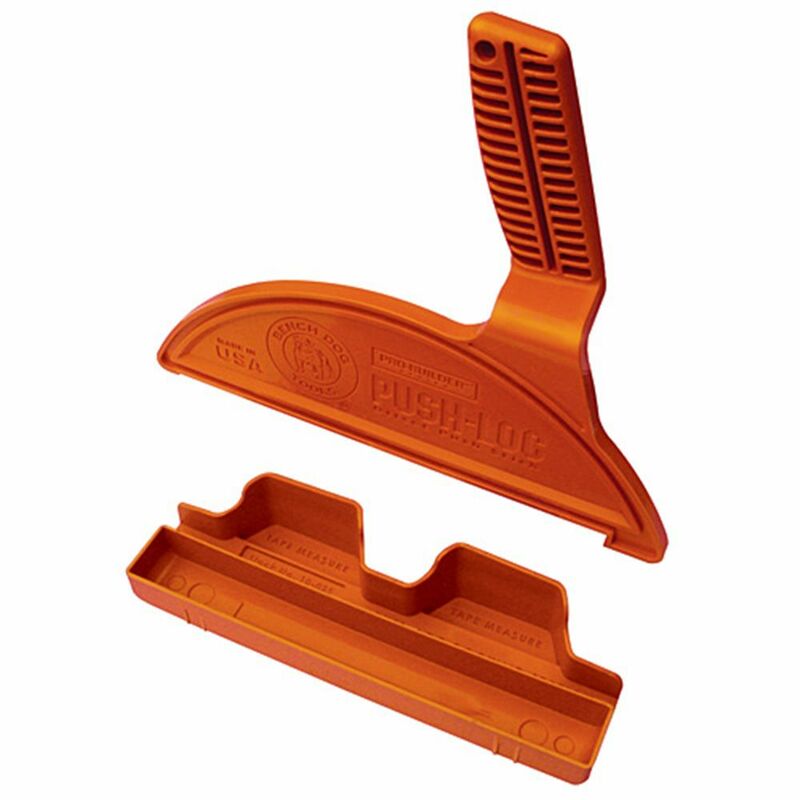 The distance between the sole of the pushblock and the horizontal offset for the handle is 3 5/8". The cleat of the pushblock protrudes 5/16" below the sole, but the foam grippy material is within that and perhaps 3/32" uncompressed.. The left side of the handle at base is 1 1/8" from the left side of the block. The handle is about 3/4". However, the handle is slightly tilted to the left. Total width of the block at it's widest is just under 2". what is the thickness of the push stick? BEST ANSWER: It is right at 3/8, measuring it as I respond. By what means does the docking receptacle attach to the fence (or other designated location)? BEST ANSWER: I bought mine a while back, and assuming the design is the same, it doesn't have a way to attach other than using 2-sided tape, epoxy, screw in to a table extension, etc. I've never used the docking receptacle, as I lay it on the fence at exactly the place where I want to pick it up and use it as the work piece is moving through the saw. By the way, It works extremely well, giving you much more control than a traditional push stick that only supports the back corner of the work piece. Thanks, Terry. Kind of what I was thinking. If I mounted it to the fence, it would a nuisance when wanting to use one of my fence-mounted jigs. There are two screw holes in the tray area so it can be screwed down. Heavy duty double stick mounting tape would work well, too.